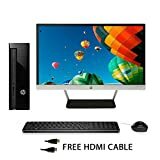 HP Slimline 411a000na (T1H50EA#ABU) Desktop PC Intel Dual Core N3050 1.6 GHz / 2.16 GHz Turbo Processor, 4GB RAM, 1TB HDD, DVDRW, HDMI, Card Reader, USB 3.0, Windows 10 – Bundle With 21.5-inch HP LED Monitor with Free HDMI Cable. Names you know. Performance you can trust. We want you to buy confidently; so all our products undergo a set of rigorous hardware tests to guarantee you’re bringing home affordable quality that lasts. From the Intel processors to the Windows 10, these HP Towers are packed with reliable and proven technology from trusted brands.h1 Create picture-perfect portraits and pro-quality videos with the powerful and dynamic CyberLink PhotoDirector and PowerDirector photo and video editing software. Add a second monitor for even easier editing.h2 With unlimited access to music and exclusive content for HP customers, there’s no need to search for it, as it comes to you. SuperSpeed USB 3.0 offers up to 10 times the bandwidth compared to USB 2.0. It maintains backwas compatibility with USB 2.0 devices. The slim, sleek and affordable HP Slimline desktop PC provides the performance you need. An Intel® Celeron® processor and 4Gb RAM can handle everything you need, from everyday jobs such as email, social networking, watching a movie through the built-in DVD/CD drive and helping the kids with their homework. High definitionAudio 5.1 also brings all your entertainment to life, including music and films through the built-in DVD drive. Share the captivating experience of ultra-wide IPS viewing technology, stunning Full-HD resolution, and a 5,000,000:1 dynamic CONTRAST ratio radiating from the HP Pavilion 22cw IPS LED Backlit Monitor. A noticeably slim contemporary designed display delivers exceptional performance on an edge-to-edge bezel-less screen that is Technicolor certified and environmentally friendly – all at an appreciable price. Share consistent high-color fidelity with In-Plane Switching (IPS) technology across a 54.6 cm (21.5″) diagonal screen. A stunning vantage point for everyone, from almost any angle. The contemporary thin profile is enhanced by the modern black and silver colors. The open WEDGE stand design provides convenient access to VGA and HDMI port connections. 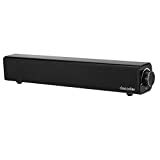 Great Stereo Sound: 20W Output from Dual 10W Drivers delivers 3D stereo sound and an unparalleled cinematic deep bass with impressive volume, perfect to use in your living room. Bluetooth Connection: Easy to pair with your Bluetooth-enabled devices such as, for iPhone7 6Plus, for Samsung S7 / Note 5, etc. Offers a wireless connection range of 10 meters. AUX IN Function: With 3.5mm audio port, it is compatible with almost all 3.5mm audio devices, such as smart phone, desktop PC, laptop, MP3, MP4, TV and more, convenient to use. Long Duration Time: Built-in rechargeable 4400mAh battery provides up to 6 hours of playtime and long time standby. Recharge in just 3-4 hours with included micro USB cable. Compact and Portable: Compact size with four anti-slip feet enables it to easily sit on the desk or on the floor. You can move it around from room to room. With a rotated button, very easy to operate power on/off, volume+/-. Docooler Bluetooth Speakers with line-in function vouches for a very simple setup yet superior performance and great enjoyment of sound no matter if you are listening to music, watching a movie or playing games, just sit back and enjoy! Home Theater: Perfectly match for your TV to turn it into a complete entertainment system, especially best for home theater. Super sleek, tabletop design looks very fashionable and stylish. Just £899 with 2 year warranty, new price £1999! Refurbished semi ruggardised Panasonic Toughbook CF-53 DUAL CORE Core i5 2.5GHz semi ruggardised laptop. 4GB of RAM, 500GB Hard drive, WIFI, DVD-RW drive, RS232 serial port, 14.1″ Widescreen display, Windows 7 Professional, 3 x USB ports including 1 x USB 3.0, etc. Comes with 2 year warranty. Semi Ruggardised laptop made by one of the best manufacturers, Panasonic. Weather sealed and made for work in tough environments. Not suited to be used outdoors but good for tough conditions inside and garage/workshop/etc Unlike many other 2nd user toughbooks, this unit has all port covers intact and is in Grade A condition. This toughbook wont let you down. New price was £1999.99. Available now at a fraction of the price it comes with 2 year warranty UK mainland return to base for your peace of mind (excluding battery). Equipped with RS232 SERIAL port, 3 x USB 2.0 and 1 x USB 3.0 port, SD card reader and express card slot. Serial RS232 will allow connection to industrial/garage/workshop machines, etc. The item is in excellent condition but it will have marks on it. Comes with Windows 7 Professional, ready for work. The item is based on a powerful Intel i5 dual core 2.5GHz processor, 4GB of RAM, hot swappable DVD-RW drive, WIFI, wired ethernet, 15.4″ daylight readable display and a massive 500GB hard-drive. The item has 3 usb ports and express card slot. It also has connection for a docking station /line out audio, etc. Battery will hold charge but we cannot guarantee how long.